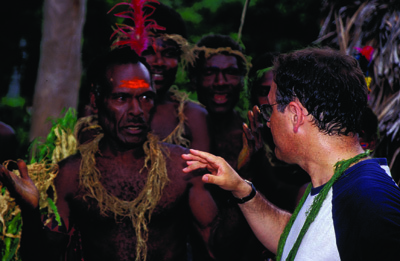 In 2004, I traveled to the South Pacific to the island chain of Vanuatu to write a travel article for the New York Daily News. People are curious once again about the connection that I found between indigenous people and magic. For them, I reprint this article. In Vanuatu, a string of islands in the South Pacific, the natives all live a secret life. 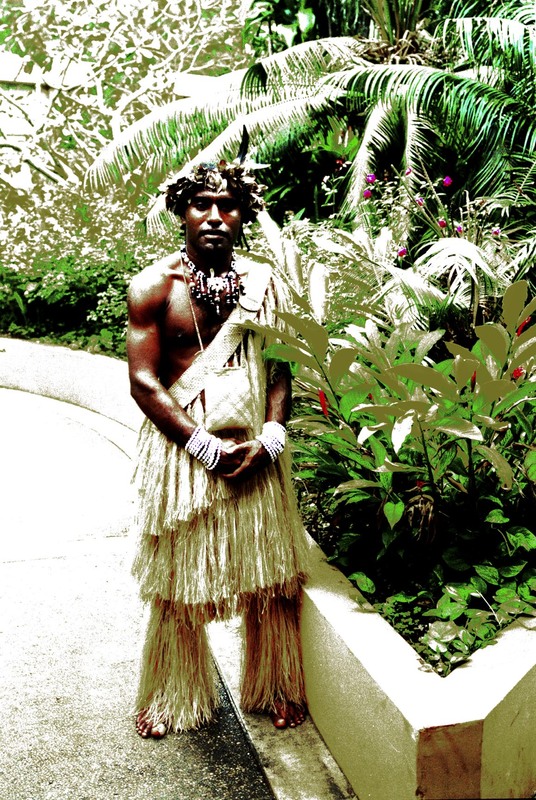 At Le Meridien resort, a fit young Melanesian man in a grass skirt and headdress opens the door of your taxi with a warm smile, but he is not what he seems. Neither is the husky Melanesian bartender at Breakas, where you swim up to the bar and order a Margarita while gazing at a stunning beach. Nor the slender Melanesian driver who takes you three hours over dirt roads to the active volcano of Mount Yasur; here, nobody is what they seem. The people of Vanuatu, men and women with dark faces and old ways, are called ni-Vanuatu, meaning literally, “people of Vanuatu.” Today, nearly all ni-Vanuatu believe in a world in which magic, real magic, is a literal fact of life. In Vanuatu, they will tell you, there are magic men who can fly, transfigure into animals, and walk around invisibly. Dead spirits reside in banyan trees, which can be seen beside every highway, and which are illegal to cut down without the clearance of a magic man. And if you don’t watch out, practitioners of black magic will cast a curse on you. I was inexorably drawn to this magical land, since I make my living as a magician, performing magic in nightclubs, at sales meetings, and at various other corporate events. But I worried: How would the ni-Vanuatu react to my magic? I had heard of the American soldier who was stationed on Vanuatu during WWII, and to whom they had later named a religion: the John Frum cult, named after the sergeant’s own name, “John from America.” And I had also heard of the Christian missionaries who had been eaten by the ni-Vanuatu in the 1800s, when cannibalism was simply an expression of displeasure. I wondered if, after seeing me pull a coin from a child’s ear, the villagers would throw me in a pot or start a David Frum religion. When you fly into Vanuatu, it is Port Vila on the island of Efate that you see first. It is a bustling town of 36,000, the streets populated mostly with black-skinned ni-Vanuatu and Australian tourists. 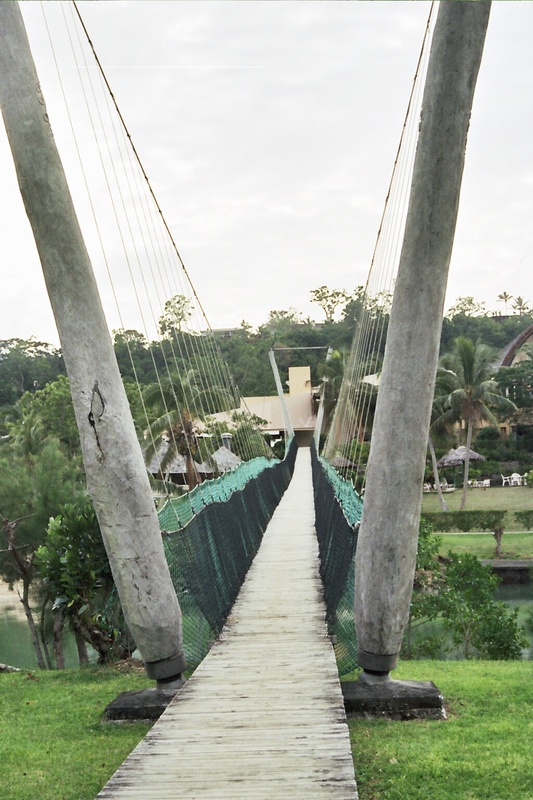 I ran into several eyewitnesses to real magic in Port Vila, and even more believers—nearly everyone here believes—but the most riveting was Paco Mete, our guide at the Botanical Gardens. Before leaving the Botanical Gardens, I read a display that told the secret of how some magicians walk around invisibly. First, they boil a black cat live. Then they place one of the cat’s bones in their mouth. Finally, the display declares with confidence, they can walk around invisibly. Everywhere I went in Vanuatu, people encouraged me to drink kava, a local leaf that is distilled into a hallucinogenic beverage. After drinking kava, you can see and even talk with the dead spirits, they told me. Port Vila, however, was the capital town. I was eager to see what lay in store for me on one of the more remote islands. Tanna, I had heard, was brimming with magic and mystery. 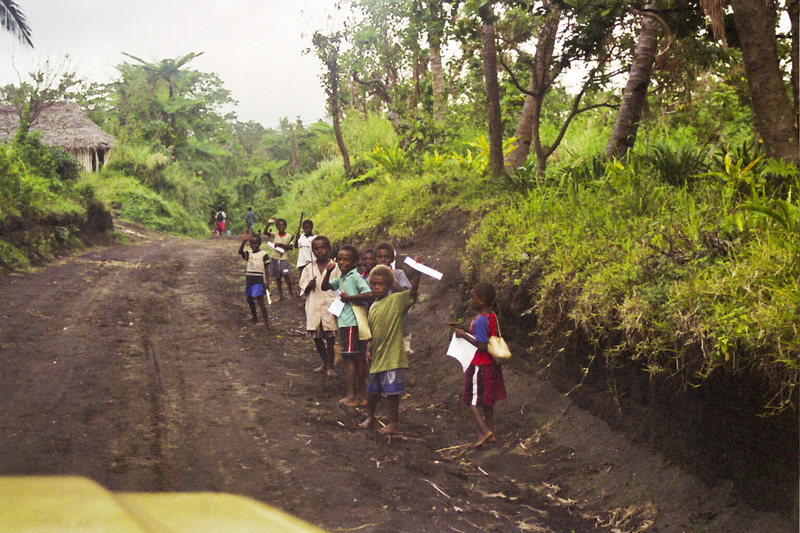 There are 28,000 people on Tanna, most of whom are villagers who live in thatched huts in the jungle, without benefit of electricity or indoor plumbing, without a Western education, without television, radio, or mass media of any sort. Many Tannans believe with all their hearts, beyond a shadow of a doubt, that magic happens every day, all the time. So when the opportunity arose to visit Tanna, I leapt at the chance. A flight to Tanna is a flight away from all modern security concerns. We boarded a 10-seater plane, without any kind of X-ray screening, and one of us sat next to the pilot. 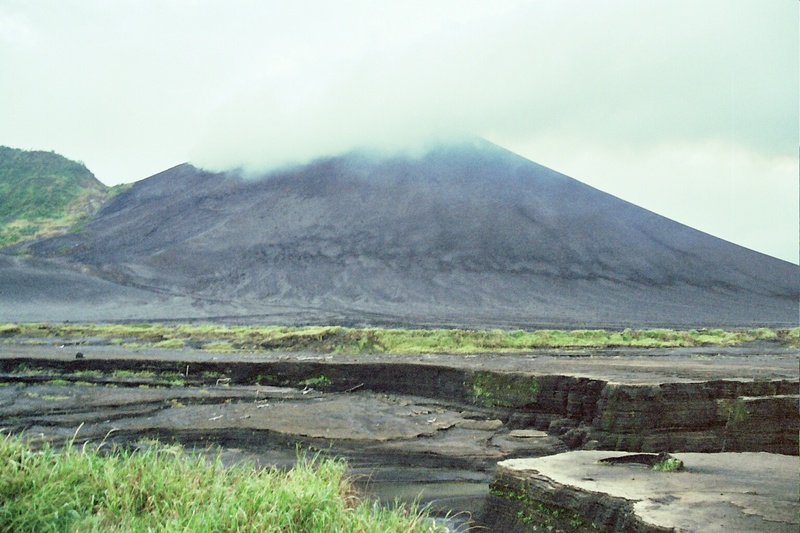 Once we landed, the Tanna International Airport was no larger than a steakhouse. Whitegrass Bungalows is a charming property with 12 bungalows perched directly on the oceanfront, each with an incredible panoramic view of reefs, ocean, and endless sky. Each hour, it seems, reveals a different visual masterpiece. That evening, a group of us sat down in the Whitegrass restaurant with Chief Tom Numake of the Evergreen Village, a Melanesian man with a black face and an authoritative, dignified presence. “A magic man can turn into a dog, squirrel, flying fox,” Chief Tom said plainly. “If he doesn’t like another man, he can wait till the man go fishing, then turn into a shark and eat the man. A magic man can turn into a cat and climb in a window, and if you touch this cat, you will die. “And devils are real. When you come across a devil, your ears become long like a cow’s ears, your hair becomes colder, and you start shaking. “I know these magic men, and they can fly from island to island—bam—in two seconds. And you can going flying with him. You hold on his pants and close your eyes. You hear singing and then you start flying. You fly straight—straight through buildings and mountains and whatever stands in your way. There was not a trace of humor in his voice. Then he described what magic men use to communicate instead of telephones. 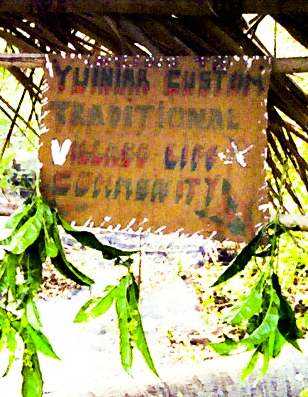 The next day, we toured Yuiniar, a kastom village, meaning a village that follows “custom,” the old ways. There, for an admission price, they give you a fascinating glimpse into indigenous life. A ni-Vanuatu guide with a bare chest showed us around and described what life is like in this primitive village in the jungle, from hunting and gathering, food preparation, social life, and the like. 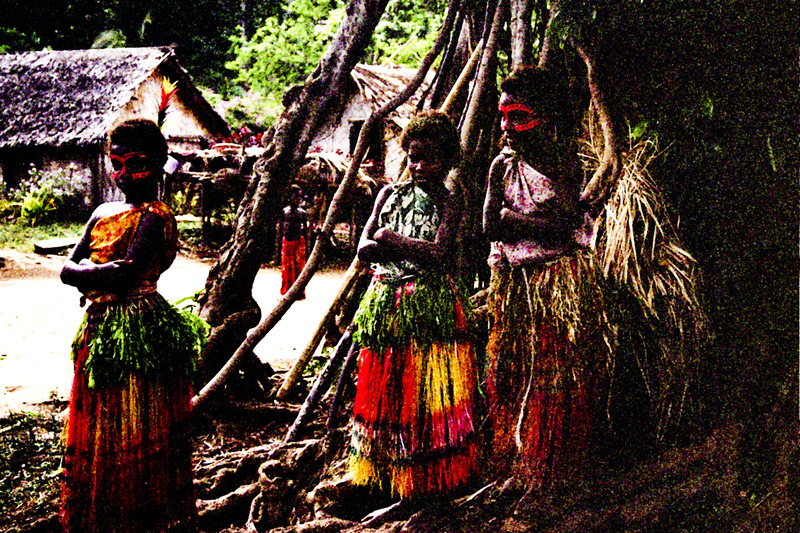 After the 40-minute tour, in a large clearing in front of a huge banyan tree, where the dead spirits reside, over 300 villagers in grass skirts and painted faces performed a tribal dance. They were asking the gods to bless their yam harvest. Finally, when the dance was over, our driver, Belden, asked the chief whether I could perform a show for the villagers, and he consented. The entire tribe gathered around me. If there was a moment to be afraid, this might have been it. These are people, after all, who dance to please the gods. I performed the sponge balls, and after each magical moment, there was an audible “Ohhhh!” as 300 people expressed their astonishment at the same time. A few superstitious elderly Iwners laid back with a conflicted, suspicious look on their faces, like maybe I’m the real thing, like maybe I’m going to put a curse on them, like maybe I’m a devil who’s come to make their ears long like cow’s ears. But in the end, to my relief, I didn’t get thrown in a pot. I also performed a rope trick, the disappearing scarves, and Ashes on the Palm, and they loved it all. As we were driving away from Yuiniar, over bumpy dirt roads, heading back to our bungalows, Belden finally spoke. Back in Port Vila, I took a cruise with Peter Whitelaw, owner of Sailaway Cruises. Peter is an Australian who sailed into Port Vila in 1980. A cyclone suddenly hit and his boat was destroyed. He’s remained in Vanuatu ever since. 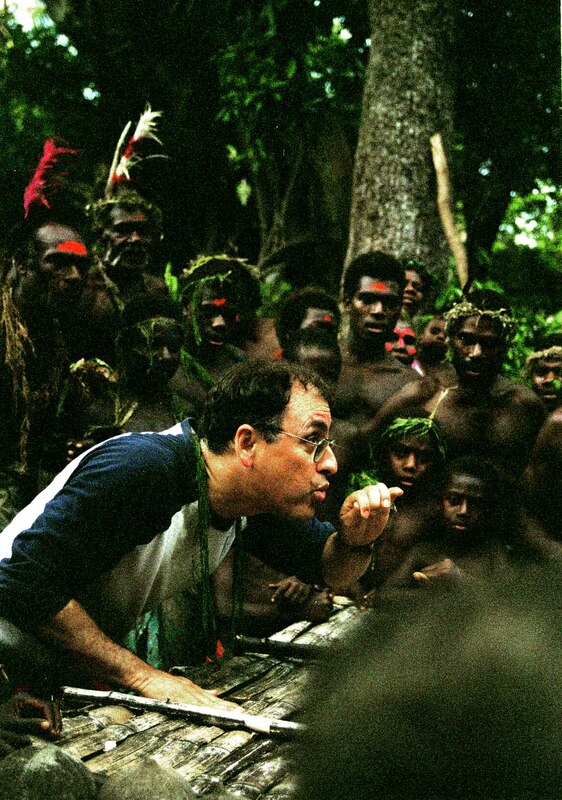 Whenever anyone dies at a young age or gets sick unexpectedly, Peter says, the ni-Vanuatu assume that someone cast a curse on that person. But then he made a stunning confession: He, too, had seen real magic firsthand. Peter is clearly a Western mind, an Aussie with a B.S. in electrical engineering. A couple years ago, one of his ni-Vanuatu boatmates told him that he was being dogged by a curse that had been placed on him. Peter was skeptical, of course. But then one day, the mate was eating in the galley when his plate split into pieces in front of them all for no reason. The shards and food all fell to the floor. “This happens all the time,” said the ni-Vanuatu man with a besieged look on his face. 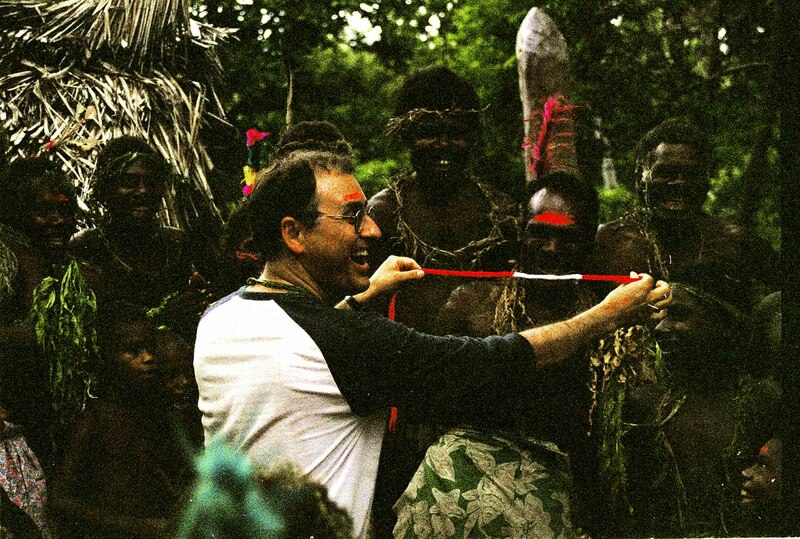 When I perform magic in the States, standing onstage with my magic wand, most people consider what I do “just tricks.” But there is a whole world out there, hundreds of millions of indigenous peoples, who believe that the world is more than just numbers and facts and the concrete. They believe that the world is, like the stunning volcano on Tanna, surprisingly malleable and unexpectedly wondrous, that the world is, in a word, magic. And who am I to disagree?